Many video recordings of Sri Sri Babathakur delivering discourses and events on various occasions and at various places have been done. Only a few out of these has been made available so far. Prajnanpurush Sri Sri Babathakur has spontaneously revealed the Science of Oneness through His various discourses. This 'Science of Oneness' of God man and universe has revealed in Him through original talks and revealed songs. Some of His discourses and ambrosial sayings have been encapsulated here. Click on the links below to view a few Video Clips of Sri Sri Babathakur's discourses. 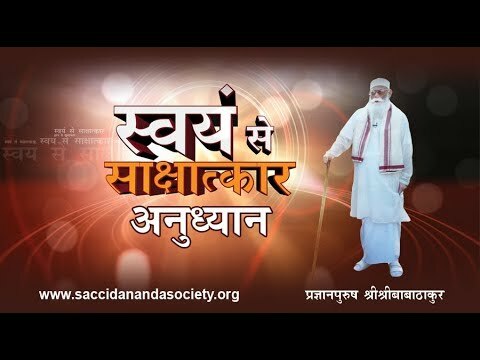 Here, we bring to you a few episodes of the TV Program ‘Swayam Se Saksatkar’ broadcast on Aastha Channel every Sunday at 6:50 pm. In this program Prajnanpurush Sri Sri Babathakur's Divine Teachings are presented in Hindi, elaborating in brief, the highlights from His video discourses. Attempts are made to cover one particular spiritual topic in each episode so that the seekers and viewers can assimilate the Master's teachings in easy steps. Click on the links embedded in the icons/headings below to view the particular episode.